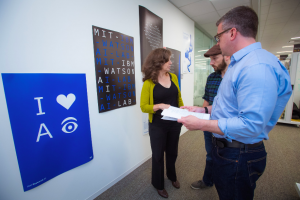 From left: Lisa Amini, Christian Muise and David Cox at the MIT-IBM Watson AI Lab. Photo credit: Gretchen Ertl. Artificial Intelligence (AI), perhaps more than any human invention before it, holds the potential to reshape our world. In just the last few years, we have seen a new explosion of AI development, fueled by increased computational power and data availability, and the power of deep learning. New AI methods and startups are springing up daily, and the excitement around AI is palpable. At the same time, as in any scientific endeavor, there are many paths forward and challenges that remain. AI is poised to touch almost every aspect of our lives, but, for it to do so, we must sustain the pace of discovery and steer that progress in ways that serve us all. It is against this backdrop that IBM and MIT have joined forces to establish the MIT-IBM Watson AI Lab, a first-of-its-kind industry-academic collaboration backed by a $240m commitment from IBM, founded with the goal of charting the future of AI. Today, as we celebrate the one year anniversary of the Lab’s announcement, we take a moment to both look back at the shared history of MIT and IBM, and to look forward to where we aim to take AI in the future. Our Lab was founded with the goal of asking what’s next and then building that future. 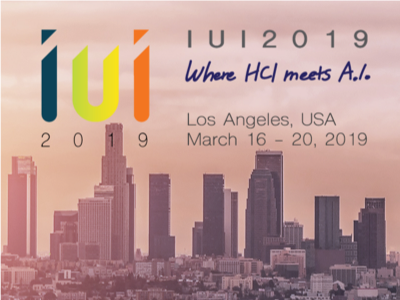 Our joint effort marks a new kind of collaboration between industry and academia, and is built on a shared vision and a set of values for how AI should advance. Our vision is to cultivate an interdisciplinary community of scientists committed to advanced AI research that is neither purely theoretical nor prematurely commercial. We seek to undertake fundamental science that is deeply connected to everyday people, businesses, and the problems they face. Rather than asking how today’s AI can have impact, we instead ask what fundamental advances are needed for tomorrow’s AI to change our world for the better. Just one year in, our community is already flourishing, with nearly 50 joint projects led by the brightest minds from our respective institutions. Each project is a collaboration between MIT and IBM research scientists, who collaborate shoulder-to-shoulder on fundamental AI research. Our project portfolio spans a spectrum of fields, with all five MIT schools (and over 20 unique departments and centers) represented. Despite being just over six months into our first cycle of funded projects, our teams are already making important headway on hard problems and publishing in top academic venues. To read more, visit the MIT-IBM Watson AI Lab Medium blog.